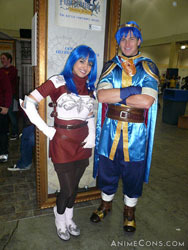 For the seventh year, thousands of otaku converged upon Boston to attend Anime Boston 2009. The convention was once again held at the Hynes Convention Center and Sheraton Boston Hotel, over Memorial Day weekend, May 22nd through the 24th. The Hynes Convention Center is a great facility for an anime convention. The hallways are wide and tall, with plenty of room for the over 15,000 attendees. The convention center is connected to the Sheraton Boston Hotel, the host hotel of the convention which also held several events. 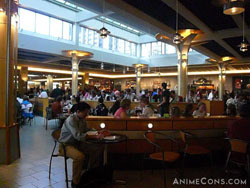 Also connected to the Hynes is the Prudential Center mall, with lots of shops and plenty of restaurants, including a large food court, which gave many easy options for attendees to eat. The large number of anime attendees and cosplayers was an interesting sight to see for people who were just walking through the mall. Anime Boston made great use of the space this year. They used a large exhibit hall to contain the registration line. By hiring Expo Logic to help with registration, the wait time to get badges was a huge improvement from the year before, with the maximum wait time for at-con registration being two hours, and less than an hour for pre-registration. Attendees were extremely excited to be able to enjoy the convention instead of waiting in line. The dealers' room was spread across two connecting exhibit halls, creating tons of space in between booths so that people were able to walk around, chat with others, and take pictures of cosplayers with no problems, which can often cause issues with the crowds in dealers' rooms. The room had two great industry booths. The first was a Nintendo booth promoting the new DS game Fire Emblem: Shadow Dragon. They had drawings for a new Nintendo DSi, people dressed up as the main characters from the game, and an elaborate booth that looked like the inside of a castle where attendees could try out the new game. Right next to that was the FUNimation booth, showcasing one of its newest shows, Romeo x Juliet. Cosplayers dressed up as many of the characters from the show and some lucky attendees received special passes to the premiere of the English dub on Saturday afternoon. The artists' alley took up a huge hall on the third floor, with rows upon rows of artists selling everything from buttons, to illustrations, to jewelery, and lots more. There were two video game rooms, one in the Hynes and one in the Sheraton, as well as a room for LARPing, CCGs, and role playing games. There was also a manga library for those who want to try out new titles or read old favorites, and a karaoke room where attendees could sing to their favorite anime and Japanese songs. Main Events hosted several big events during the weekend. Friday saw Opening Ceremonies, where the chairs welcomed everyone and introduced guests; Anime Unscripted, an anime/geek influenced improv game hosted by PatrickD with voice actors participating; and the AMV contest. Saturday had the two biggest events of the convention, Saturday's concert with Kalafina and the masquerade. 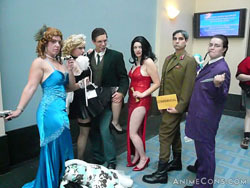 On Sunday, the convention concluded with Cosplay Chess and Closing Ceremonies. The theme of the convention this year was mystery, and the theme and Cosplot were woven through many different events of the convention, including Opening and Closing Ceremonies, the Dating Games, the Masquerade, and Cosplay Chess. The convention's mascots, A-chan and B-kun were caught up in their own drama with the convention villain, while the Cosplot had to solve the mystery of the murder of Sailor Moon. While waiting for big events to start in the main auditorium, the staff kept attendees entertained with a pre-show in the big screens. It included funny lists, letters to Anime Boston, sing-a-longs, "Good Idea/Bad Idea," and the Death Star from Star Wars bringing an end to obnoxious memes. It was very creative and kept the crowd occupied while waiting for the event to start. The one thing I would love to see Anime Boston do is get their main events schedule out earlier. I know things change with the schedule as a whole with panels and screenings being shifted around up to the last minute, but I would imagine that the schedule for main events is pretty solid well before the convention starts. It was very surprising to see the masquerade scheduled for 5:30pm, when last year it started at 8:00pm. The staff at Anime Boston put on a great and very strong show this year and should be very proud of the work they accomplished and improvements they made, especially with registration. The events are well run and there is a great variety of activities attendees can do, sometimes too much making it hard to decide what to do and what to miss. However, that's always better than sitting around with nothing to do. Anime Boston definitely put the name "Line Con" behind them this year. Although the lines for the concert and masquerade were again long, those are almost unavoidable and can be found at most other cons. A ticketing system could solve the problem, but that would most likely result in long lines again, this time to get tickets. Many people were turned off by Anime Boston last year because of the problem with registration. 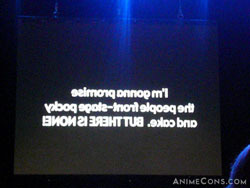 Now that this problem has been fixed, I hope that people who said "never again" to Anime Boston will return for 2010. Speaking of 2010, Anime Boston 2010 will be held April 2-4. The weekend preceding that, March 26-28, will have Penny Arcade Expo (PAX) East making it's debut on the east coast, also at the Hynes Convention Center. It will be interesting to see how the very close proximity of these events will effect each other. One thing is for sure, next spring Boston will be full of geeks and otaku, and I cannot wait. Recommendation: If you swore off or swore you would never go to Anime Boston because of the line problems in 2008, definitely attend in the future. They continue to deliver a solid, entertaining convention with great guests every year. This convention should be on every con-goer's list of cons to attend. View photos from Anime Boston 2009.